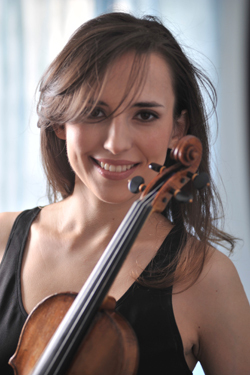 Violinist FATIMA AAZIZA joined the New Jersey Symphony Orchestra in 2007. She began her education in her native Poland and graduated from The Fryderyk Chopin Institute at the Academy of Music in Krakow. She received her bachelor’s and master’s degrees from The Juilliard School, where she studied with Ronald Copes and Naoko Tanaka. Aaziza’s awards include the Yehudi Menuhin International Violin Competition Special Award (1999); a prize at the Rodolfo Lipizer International Violin Competition in Gorizia, Italy (2000); first prize at the K. Penderecki International Competition in Krakow, Poland (2000), and a first prize at the A. Tansman International Competition in Lodz (2001). She gave the Shlomo Mintz performance of Brahms’ Violin Concerto with the Israel Philharmonic Orchestra in 2003. Aaziza has attended several music festivals, including the Music Academy of the West in Santa Barbara, CA; Bowdoin Summer Music Program and Kneisel Hall Summer Festival in Maine; Mozarteum in Salzburg; Keshet Eilon in Israel; Lucerne Festival in Switzerland; Britten-Pears Festival in Aldeburgh, UK; Music Masters Course Japan and others. She has had the honor of working with world-class musicians such as Krzysztof Penderecki, Ida Haendel, Gyorgi Pauk, Igor Ozim, Shlomo Mintz, Nigel Kennedy, Gidon Kremer, Alan Gilbert and many others. Aaziza is very passionate about contemporary music and involves herself with many contemporary music ensembles, such as the New Juilliard Ensemble, Le Balcon and Muse Ensemble. She has given solo performances in many European countries and throughout North America.